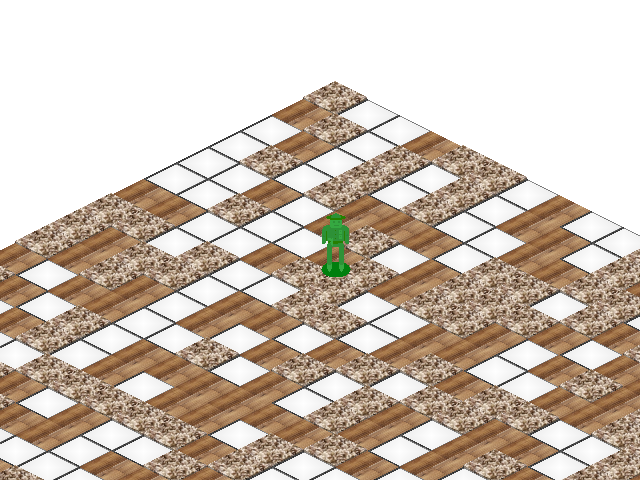 My goal is to display a tile map in isometric projection. This tile map has 25 tiles across and 25 tiles down. Each tile is 32x32. See below for how I'm accomplishing this. Here I simply scale down the Y value by a factor of 0.5. And it works, kind of. There are some tiny 1px-2px gaps between some of the tiles when rendering. I think there's some precision loss somewhere, or I'm not understanding how to get these tiles to fit together perfectly. I'm not truncating or converting my values to non-decimal types until I absolutely have to (when I pass to the render method, which only takes integers). I'm not sure how to guarantee pixel perfect rendering precision when I'm rotating and scaling on a level of higher precision. Any advice? Do I need to supply for information? If you look closely, you will notice that some tiles are overlapping the other tiles. This because the tile extends 3px above the top of the tile (0, 0 + 0, -3). This is why I have those extra 16 pixels of padding on the top and bottom. It allows me to add depth. As for the reason why you have gaps, it may not be inaccuracy, but instead the tiles aren't exactly the right shape. So if you want, you can use the tile I have above as a template. If you're willing to draw sprites pixel-by-pixel, you can make the math work. To make sure you don't leave untouched screen pixels, you can use the inverse transform. i.e., instead of mapping source pixels to screen pixels, map screen pixels to source pixels. This may result in some artifacts, but they should be reasonable. We can learn from OpenGL how to handle those gracefully: In OpenGL, a fragment's (screen pixel) color will be chosen according to which polygon contains that fragment's center. OpenGL uses a bias to make sure that if an edge is lies exactly on a fragment center, one polygon is chosen consistently (see section 3.5.1 in OpenGL 1.3 spec). If you treat your source pixels as polygons (quads) you can determine which fragment center is inside which polygon, and choose that polygon's color as the fragment color. Not the answer you're looking for? Browse other questions tagged rendering matrix isometric transformation scale or ask your own question.